Robert Greville, 2nd Baron Brooke (May 1607 – 2 March 1643) was an English Civil War Roundhead General. Greville was the cousin and adopted son of Fulke Greville, 1st Baron Brooke, and thus became the second Lord Brooke, and owner of Warwick Castle. He was born in 1607, and entered parliament for Warwick in 1628 but his election was voided on succeeding to his kinsman's peerage that year, when he became able to sit in the House of Lords. He was involved in the foundation of Saybrooke in Connecticut. Greville was imprisoned by Charles I. at York in 1639 for refusing to take the oath to fight for the king, and soon became an active member of the parliamentary party; taking part in the Civil War he defeated the Royalists in a skirmish at Kineton in August 1642. During the Civil War, he commanded Parliament forces in Warwickshire and Staffordshire and was looked on by many as the Earl of Essex's eventual successor. In 1642 he gained the victory of Kineton. He took Stratford-upon-Avon in February, 1643 and was killed shortly afterwards besieging Lichfield Cathedral on 2 March. Greville was reportedly shot by a sniper (a concealed person who fired at Greville with a rifle) and many consider him to be the first recorded victim of sniper fire. 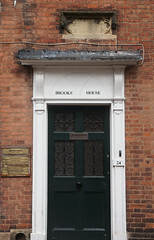 Brooke, eulogized as a friend of toleration by John Milton, wrote on philosophical, theological and current political topics. The Cambridge History of English and American Literature said of Greville,: He was an ardent puritan, and, in 1641, wrote A Discourse opening the nature of that Episcopacie which is exercised in England, aimed at the political power of the bishops. In the same year was published his philosophical work The Nature of Truth. In this work, he refuses to distinguish between philosophy and theology. "What is true philosophy but divinity?" he asks, "and if it be not true, it is not philosophy." Greville married Lady Catherine Russell, daughter of Francis Russell, 4th Earl of Bedford and Hon. Catherine Brydges, circa 1630. They had three children: * Francis Greville, 3rd Baron Brooke * Robert Greville, 4th Baron Brooke * Fulke Greville, 5th Baron Brooke (d. 22 October 1710), father of Algernon Greville (MP).